NETWORK FINALS: The final game of the NBA FINALS adjusted to 5.4, and the pre-game JIMMY KIMMEL LIVE show to 0.9. 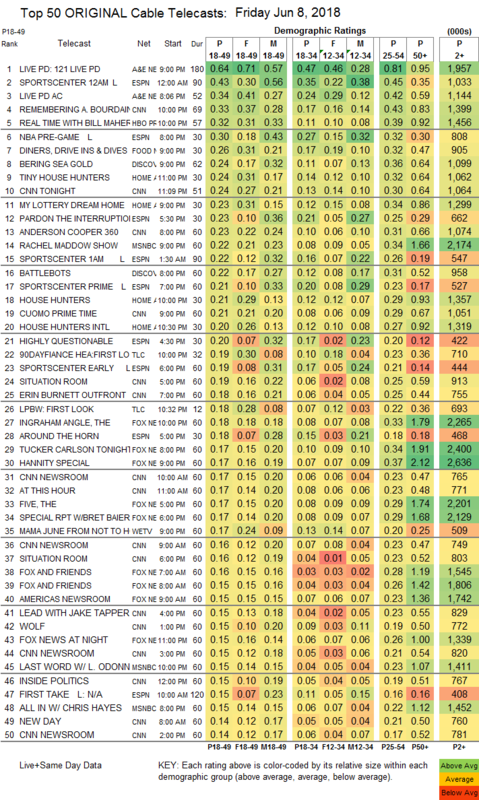 In addition, MY LAST DAYS and the AMERICAN NINJA WARRIOR rerun lost 0.1 in final numbers. CABLE HIGHLIGHTS: A&E’s LIVE PD led Friday cable, down 0.07 to 0.64. CNN’s REMEMBERING ANTHONY BOURDAIN special was at 0.33. On HBO, REAL TIME WITH BILL MAHER dropped 0.05 to 0.32,and WYATT CENAC’S PROBLEM AREAS was down 0.03 to 0.06. Food Network’s DINERS, DRIVE-INS & DIVES returned at 0.26. 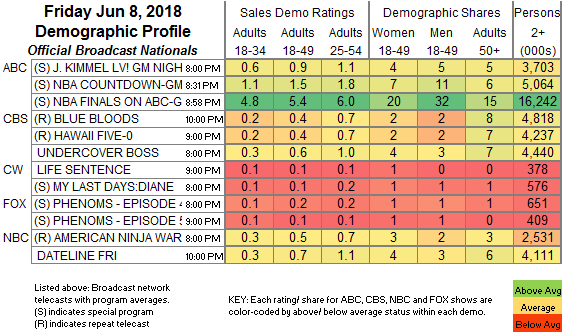 On Discovery, BERING SEA GOLD ticked up to 0.24, and BATTLEBOTS was also up a tick to 0.22. On HGTV, TINY HOUSE HUNTERS was at 0.24, MY LOTTERY DREAM HOUSE lost 0.04 to 0.23, HOUSE HUNTERS fell 0.08 to 0.21, and HOUSE HUNTERS INTL was down 0.05 to 0.20. On We, MAMA JUNE: FROM NOT TO HOT returned at 0.17, and BRIDEZILLAS was down to 0.09 from last week’s 0.12/0.11. Cinemax’s CB STRIKE fell off the chart, down 0.01 to 0.02/123K.